“Black Iron Dude”, like so many other Bloggers, have inspired entertained, lept to the sky with stardom and fizzled into the faded memories of our life. 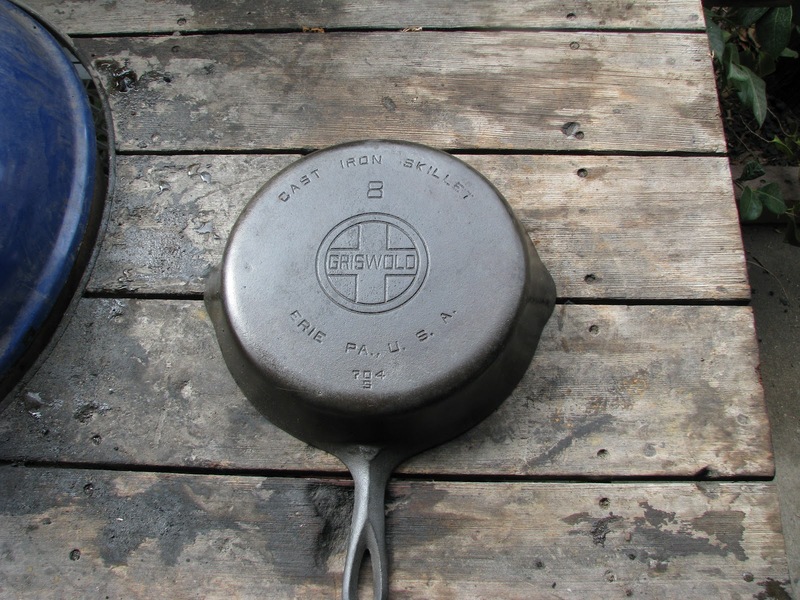 The Black Iron Dude and I have a common interest of cast iron cookware. These cooking utensils are sturdy, cheap, heat retaining, non-stick and practically indestructible. We like to call our cast iron utensils ‘Black Iron” We have two black iron skillets on standby at all times on our stove. We use them almost everyday. 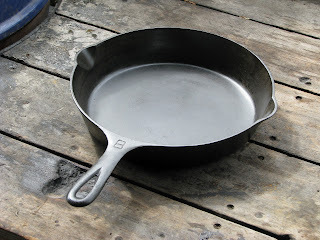 I have one skillet that dates back to the 20’s that gets daily use. 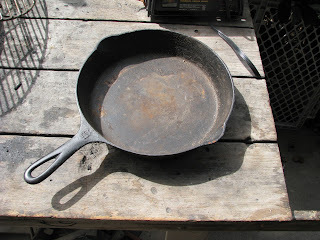 The thing about ‘Black Iron’ is once you get one functioning piece of cooking history, you want to collect more. The nice thing about Black Iron is they can be very affordable if you are ready to do a little work. 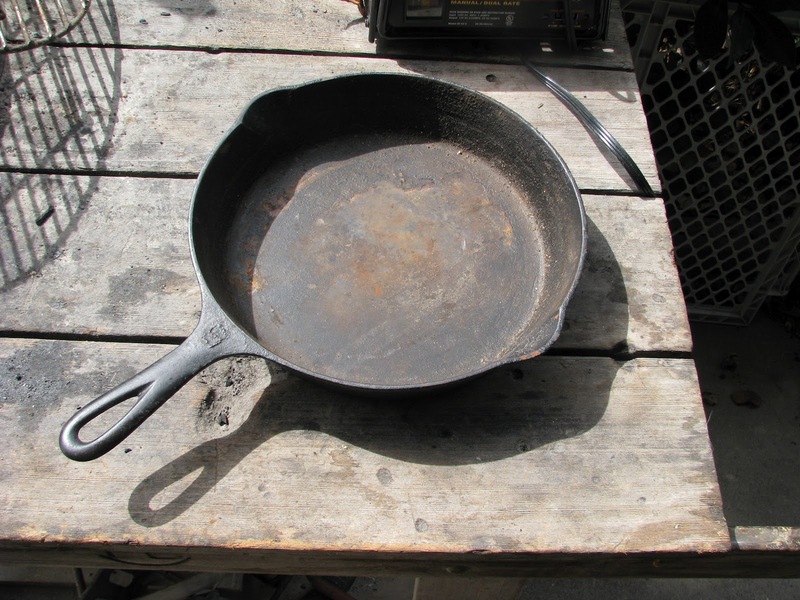 Flea markets, E-Bay, and possibly your basement will produce a rusty old skillet. It is now your job to re-store it to its prime. This is an easy task if you have the inclination and a few common house hold items. 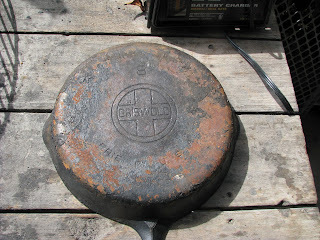 This skillet was picked up at a local flea market. As you can see it is rusty and has years of grease and grime. 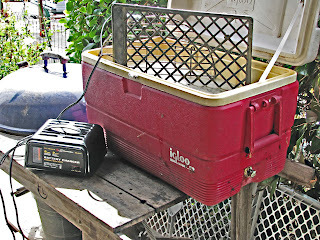 We are going to use an electrolysis bath to remove the gunk from this pan. Once the pan is clean we will immediately re-season to prevent rust. 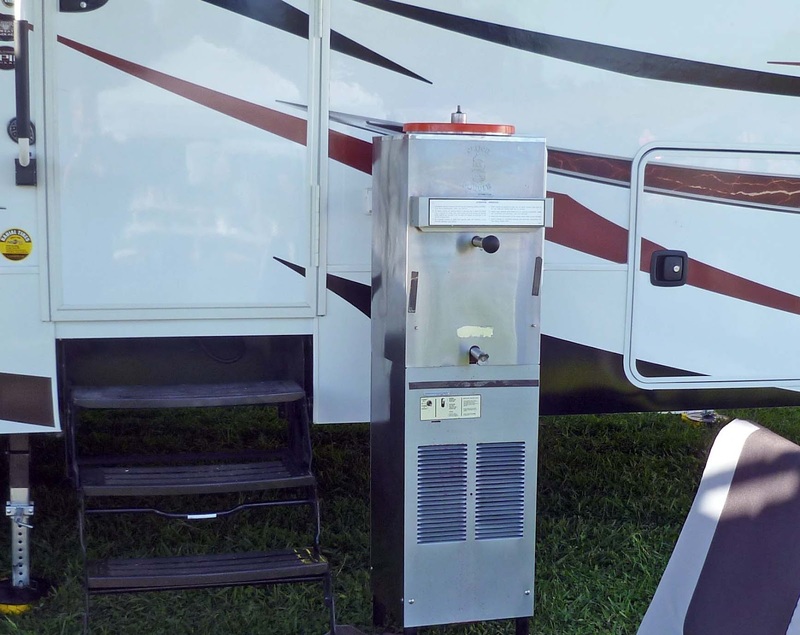 An old ice chest or any plastic tub will hold our electrically charged cleansing bath. 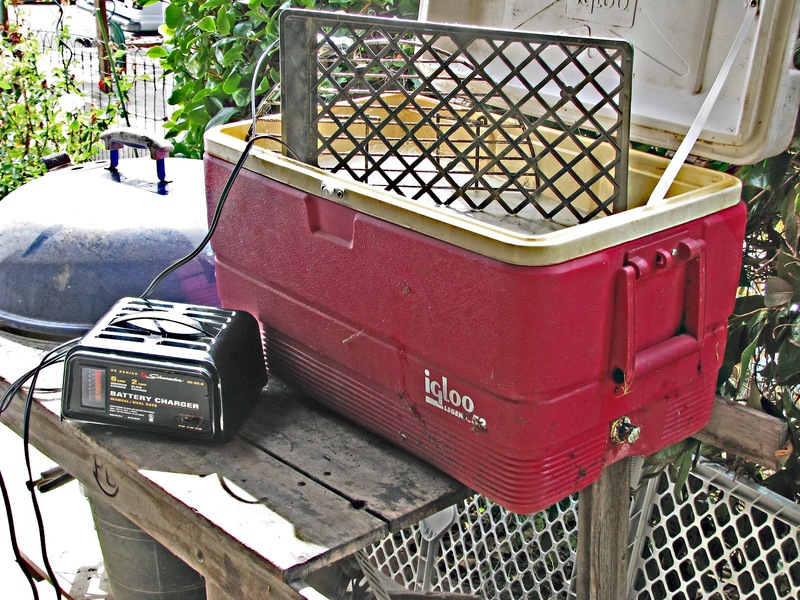 An old bbq grill or piece of conductive metal, plastic (non conductive) piece, Sodium Carbonate (dish soap) and a battery charger are the items you will need. I am now going to send you to Black Iron Dude for the full instructions. Now wasn't that easy. It is pretty remarkable how well this method works. It sounds a little scary running a current through water. Be brave and do not be tempted to lick the pan while the battery charger is on. 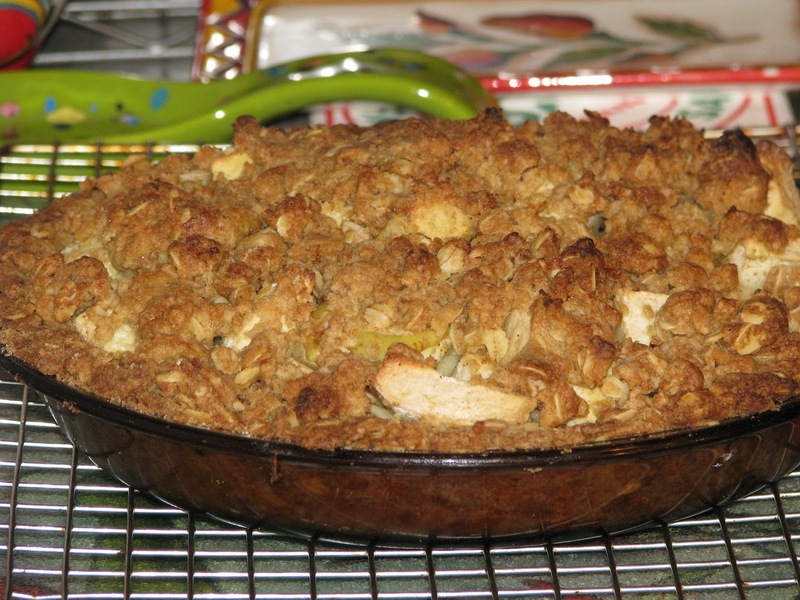 The pan was seasoned and now we have a beautiful pan that will last another life time. The Black Iron Dude dated this pan from the 30’s. 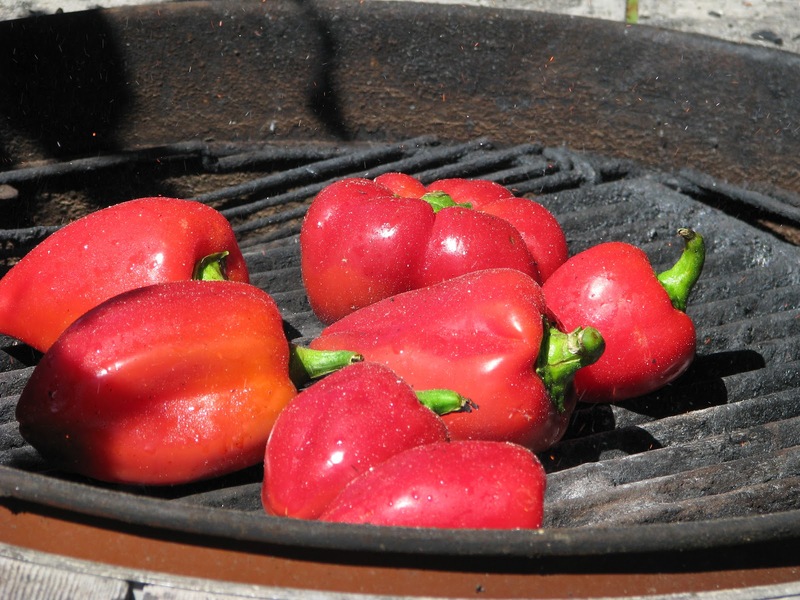 The quality is superior to any pan manufactured today. The only problem now is to locate another cast iron project. It has been a very long time since I have actually enjoyed going to work. My new job only requires me to show up one Friday a month. I am outdoors and am hanging out at a farmers market. 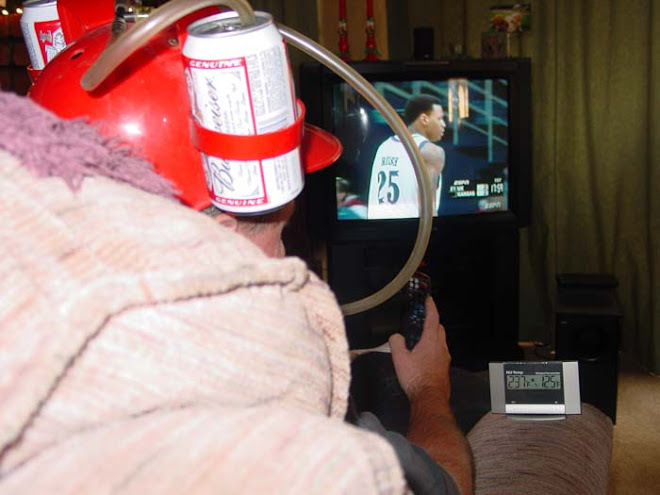 It does require me to be there throughout the day. Around noon the stomach begins to rumble. 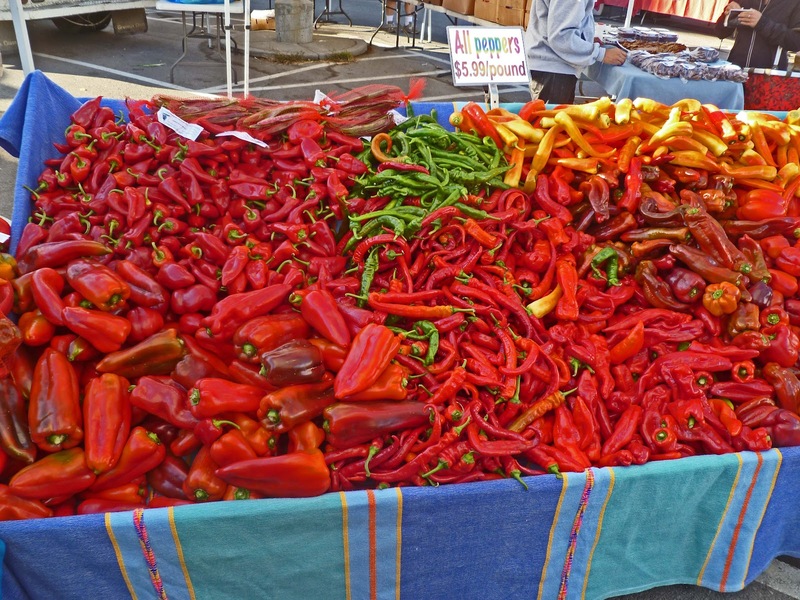 What better or healthier place to eat than a farmers market? Sure we have fresh fruits and vegetables but we also have other food options. 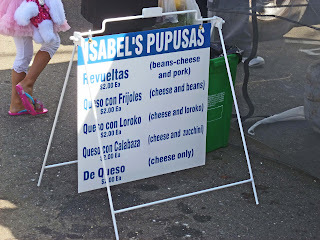 Today we will explore ‘Isabel’s Pupusas’ stand. 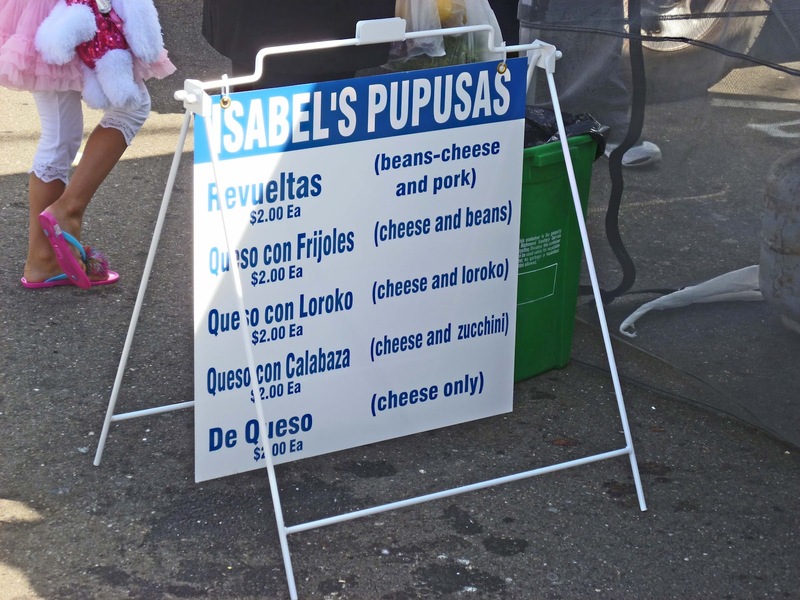 What is a pupusas? 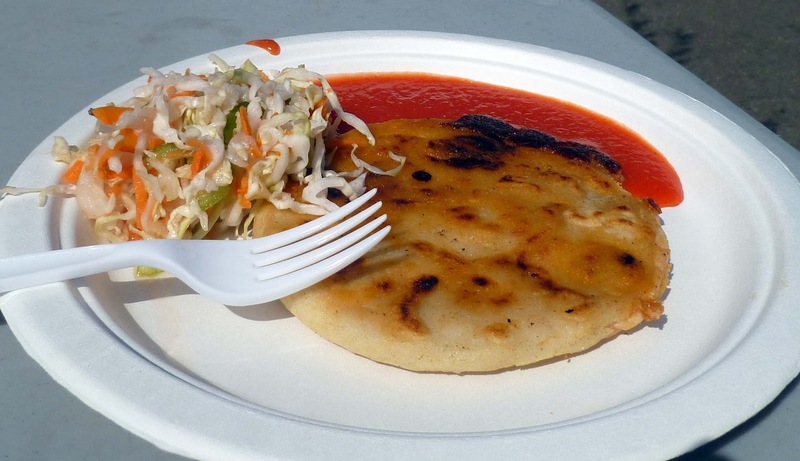 A pupusas is a traditional Salvadorian dish. It is a tortilla like cake made from masa that is filled with meat or cheese and fried on a griddle. 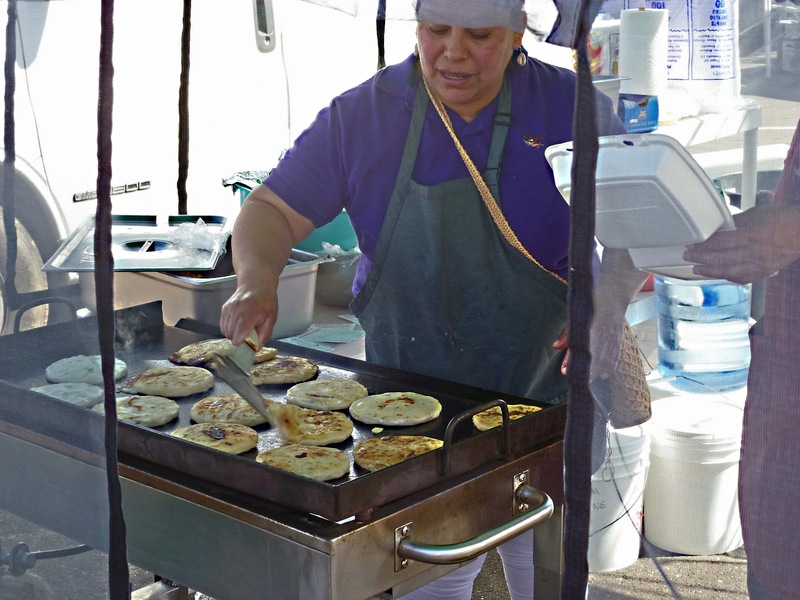 Isabel’s will make a fresh pupusas to order. 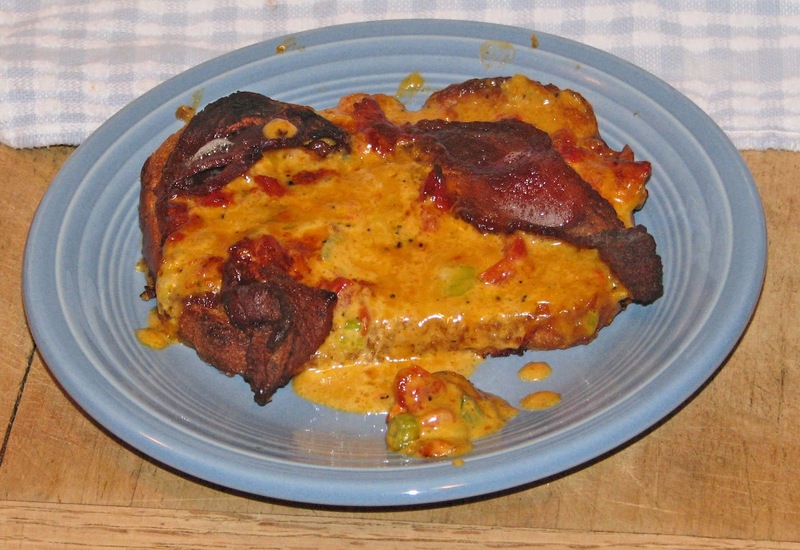 She has different combinations such as; cheese, cheese & meat, cheese & beans, zuchinni and loroco. I am not familiar with loroco but translated it means edible herb. I believe it is a flower of a plant and is on the bucket list to experience. Place your order and watch Isabel pat out your pupusas. The smell wafting from the griddle is a comforting tortilla type smell. It definitely makes my mouth water. The pupusas is served with a home made vinegar based cole slaw. 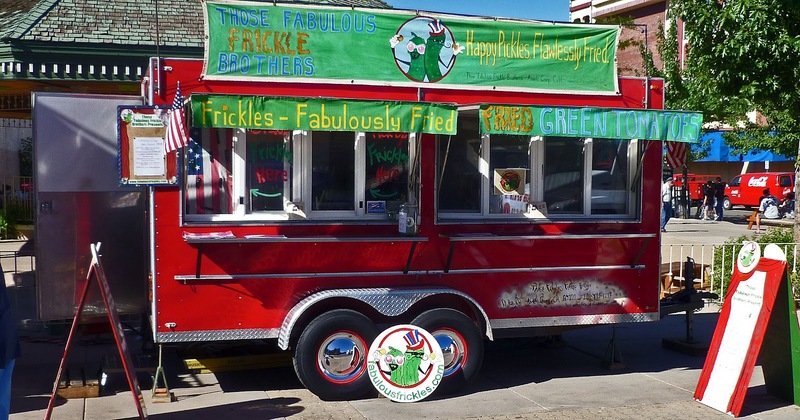 A spicy red hot sauce will be served on the side. The warm fried masa with its piping hot filling is a filling and satisfying lunch. The price for this home made treat is a whopping two dollars. What a deal. 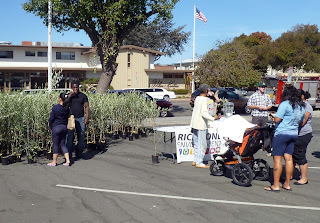 Last week we gave away 1000 olive trees thanks to McEvoy farms. It was quit the site seeing all the shoppers walking around the market with their trees. If you are in Richmond on a Friday stop on by and say hello and have a papusas. Please come down to the Richmond Farmers Market at noon tomorrow. 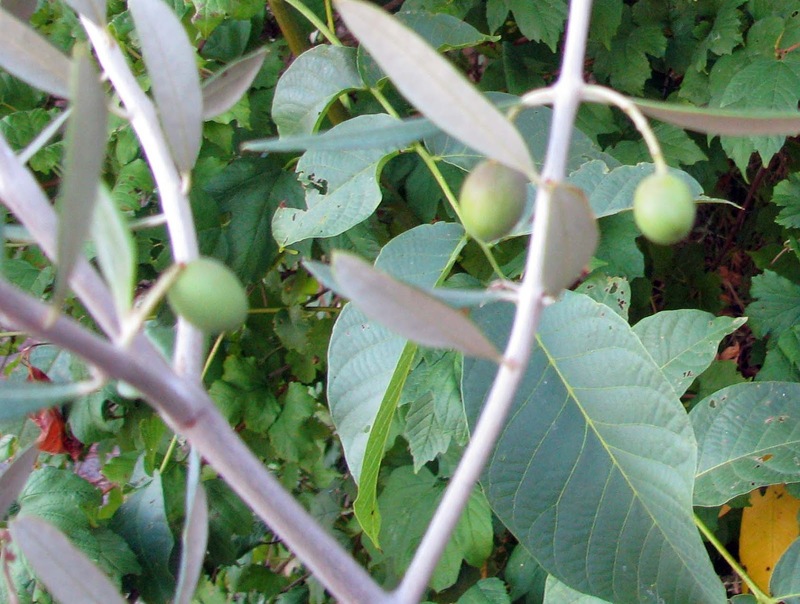 We are giving away 1,000 olive trees. No cost except to make the planet better. You may see me at my new job and in action. "Thanks to McEvoy farms we have obtained another donation of 1,000 Tuscan olive trees. These will be given away by the City of Richmond sustainability staff at noon tomorrow at the parking lot where the farmers market is held. Thanks to the awesome city staff members, Adam Lenz and Mike Ulberti." It is Saturday night and Ms. Goofy and I have hunger that needs to be satisfied. 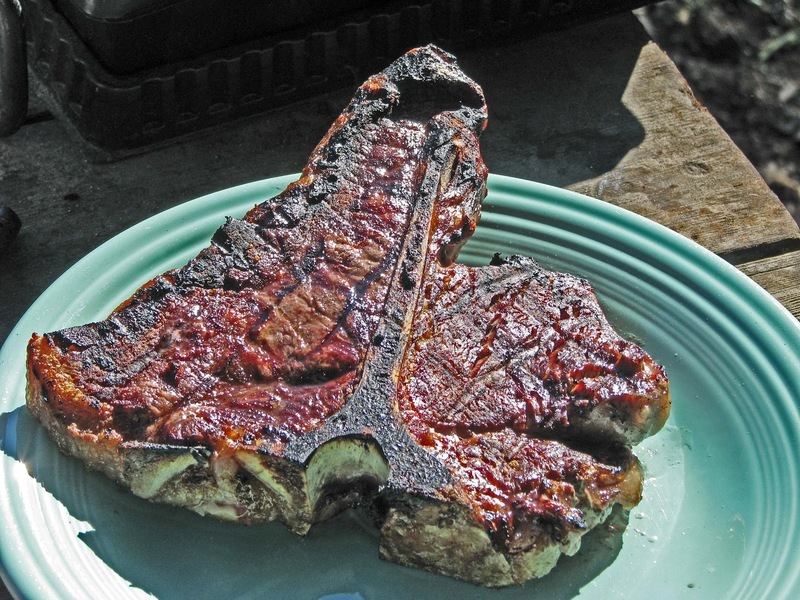 Tonight's main attraction is a 20 ounce Porterhouse steak from the U.C. 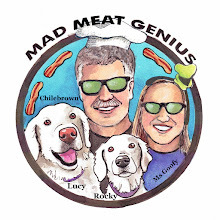 Davis Meat Labs. It was cooked to a perfect medium rare over a hot mesquite fire. It will be accompanied by a green bean casserole cooked in our trusty black iron. 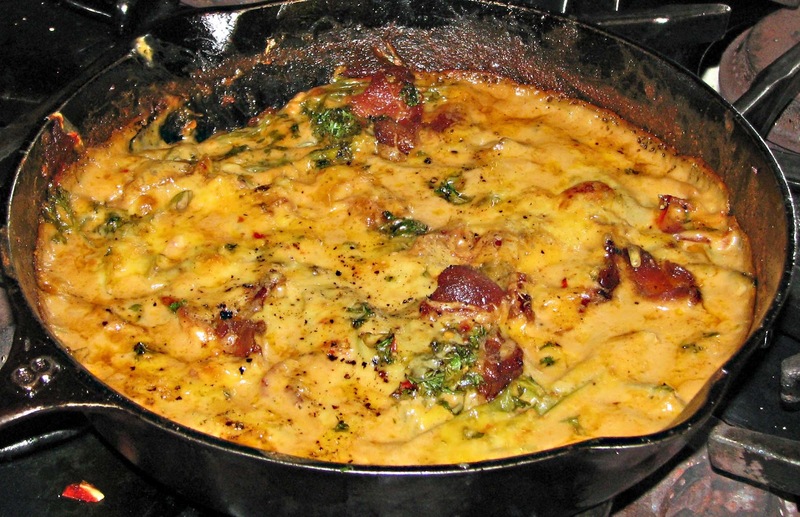 This casserole will have beans from our garden, garlic from Lakeport, bacon from Taylor's Sausage., and will be covered with a mountain of cheese from the Rumiano Cheese Company. 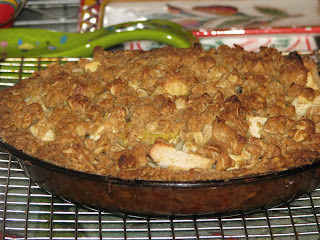 To top the evening we had a home made apple pie made with Gravestein apples from our backyard. Lookout couch because here I come. 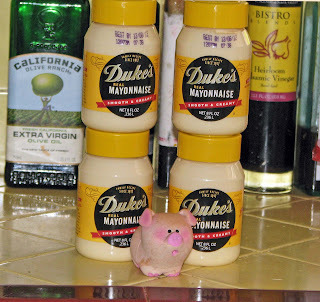 Duke’s mayonnaise is a staple product in most southeastern kitchen pantries. This regional product does not make it out to the West Coast very often. Melanie informed me of its availability at a local discount store and I took advantage of this opportunity. I acquired a couple of bottles and now had to find some recipes. In the southeast this mayonnaise is used to bind Cole slaw and potato salads. Duke’s does not add any sugar to its product making for a unique flavor. 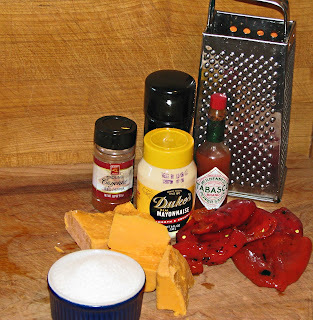 Melanie suggested a recipe for pimento cheese. 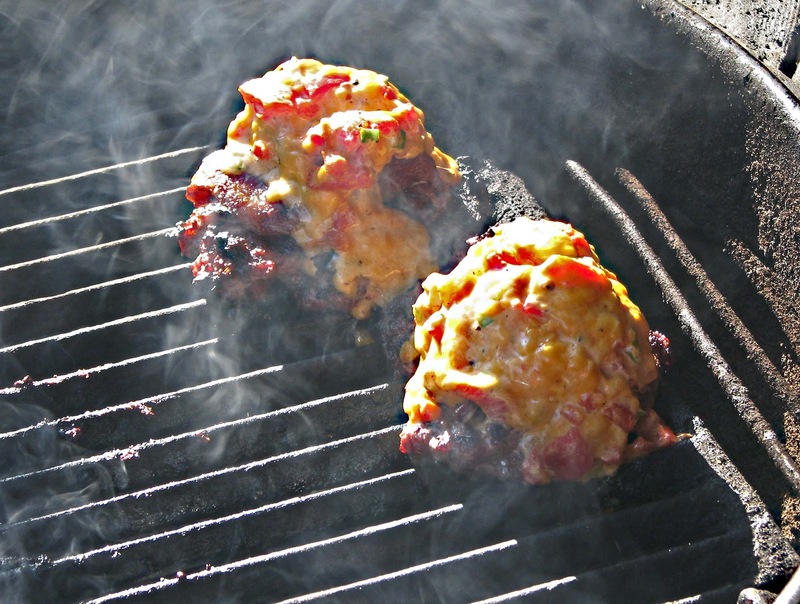 Pimento cheese is another regional dish from the south. I have to admit I am not very familiar with pimento cheese. 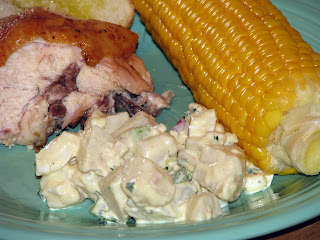 I went straight to Duke’s Mayonnaise web site for this potato salad recipe. 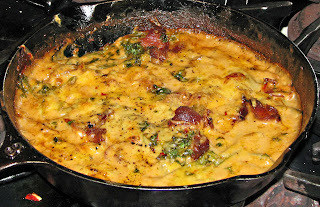 It is called “Baton Rouge-Style Potato Salad’ and is found under the recipe tab. All the ingredients were simple enough but together created a delicious salad. We served this with ‘beer can chicken’. It was quit tasty. 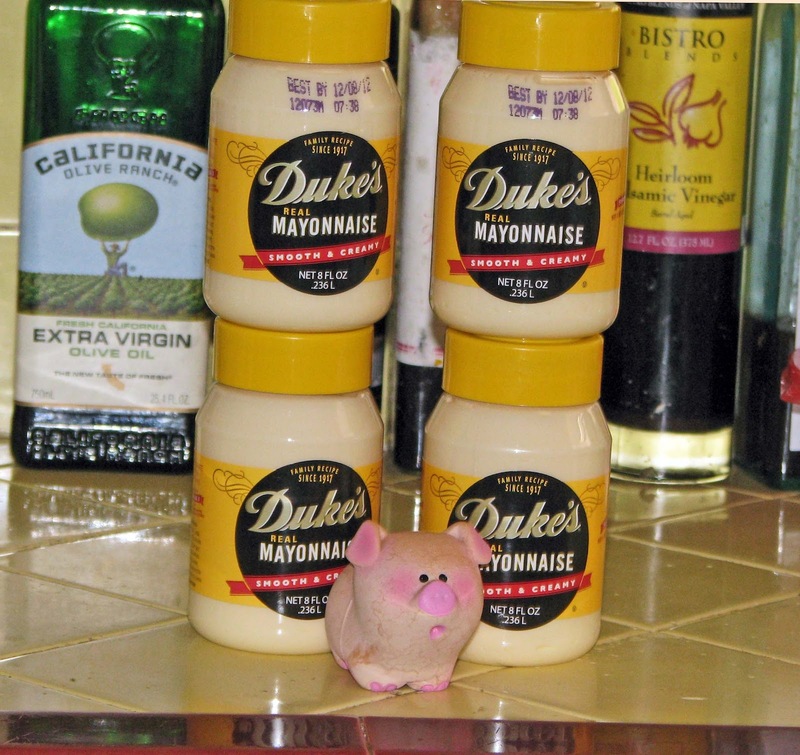 Did I notice a difference with Duke’s Mayonnaise? Not really. I needed to try this with a little simpler dish. 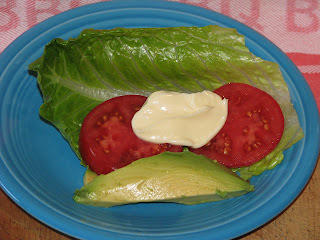 Some tomato, lettuce and avocado with a dollop of Duke’s should do the trick. It did not taste as sweet as ‘Best Food’ mayonnaise. It was still just mayonnaise though. If you were brought up in the South this may be a flavor that brings back memories. Being a West Coast native, I just do not get it. I will try to make some pimento cheese though. 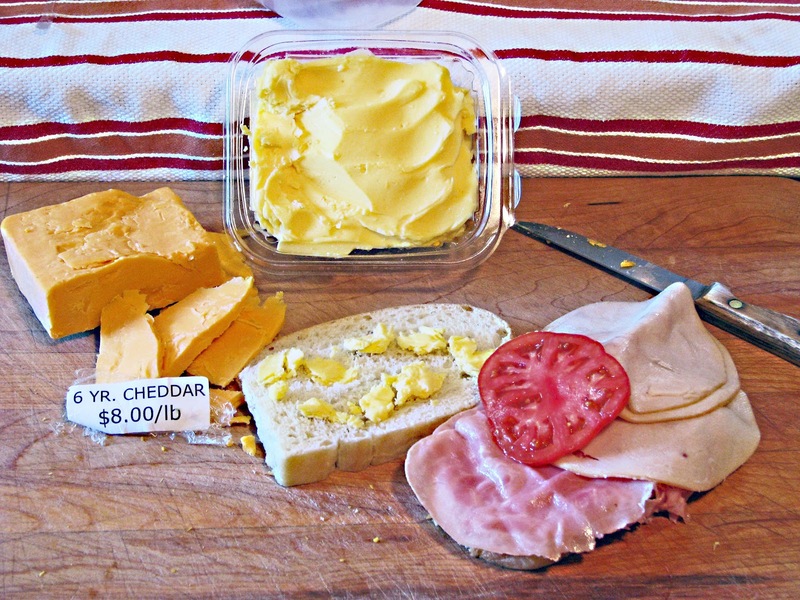 The ice chest was overflowing with cheese purchases from Ms. Goofy’s Rumiano adventure. 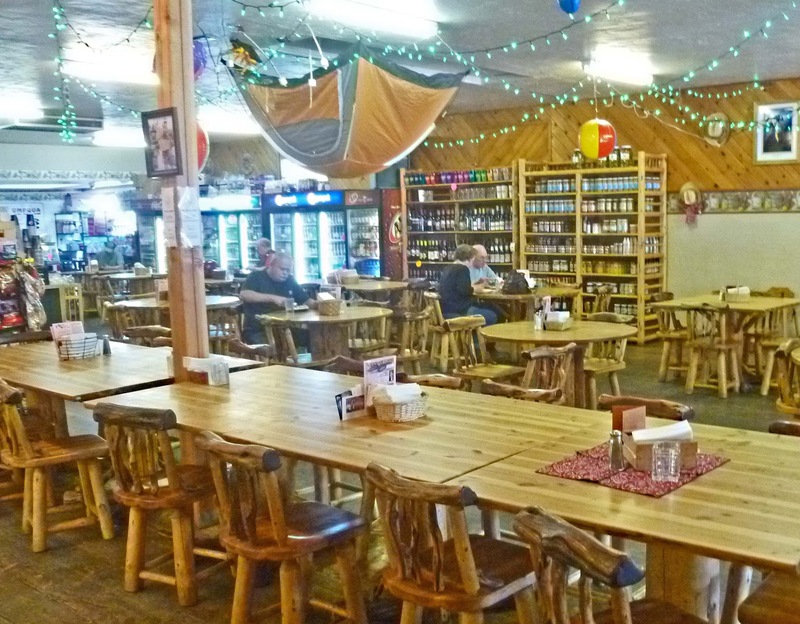 I was concerned that we would have no room for our Meat Adventure to Taylor’s Sausage in Cave Junction, Oregon. Cave Junction was little over an hours drive through a enchanted tree lined forest. It was a curvy narrow road with beautiful scenery to behold. We arrived in Cave Junction and found ‘Taylor’s Country Store’. This is the retail outlet and the actual factory is a couple of blocks away. The outside of ‘Taylor’s Country Store’ is pretty plain. One could pass this by if they did not know of the Meat Palace’ inside. Once you are through the doors you will be amazed at how big this store actually is. 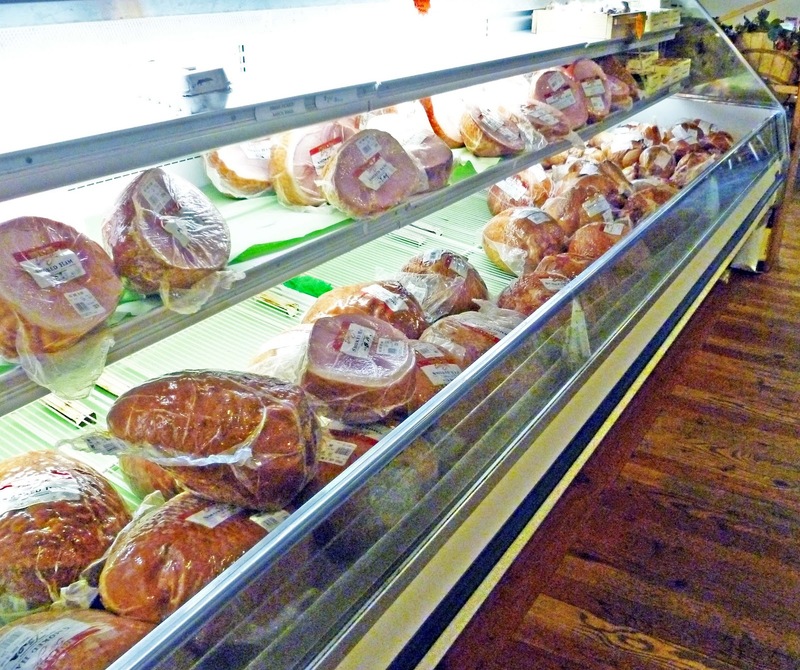 To the right the walls are lined with meat stocked freezer cases. In the middle of the store is an island of counters surrounded by more meat lockers. In this island employees can assist you with your purchases. To the left is a huge dinning area with a kitchen in the back. 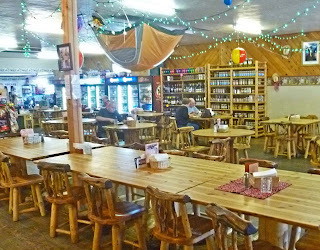 In the dinning area racks of sundries, a lot that are local, are for purchase. After several seconds to get my bearings the meat purchasing began. Where should I start? 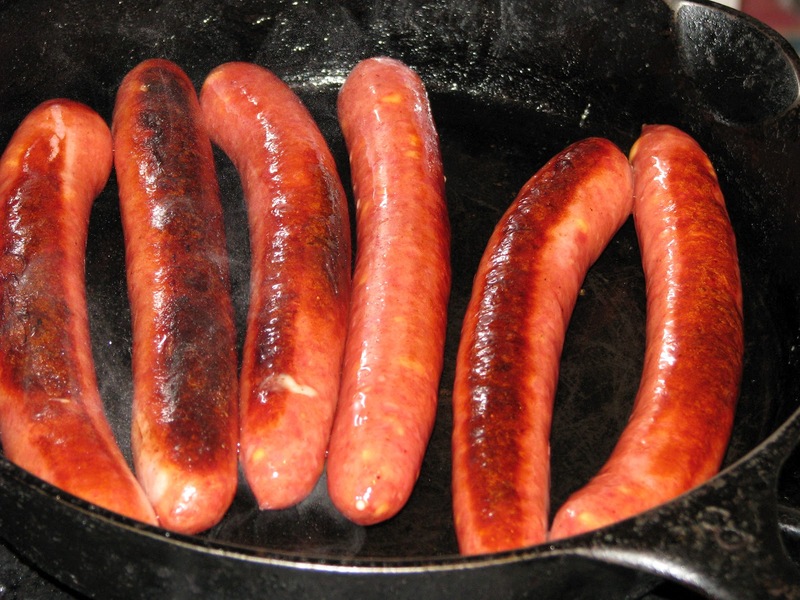 Hams, turkey, bacon, jerky and so many, I mean so many different types of sausage. Fresh, frozen, smoked, wieners & franks, cheese stuffed or not were several choices that fueled my dilemma. I tried to use restraint knowing the ice chest was half full of cheese or half empty of meat. One thing I noticed was the prices. 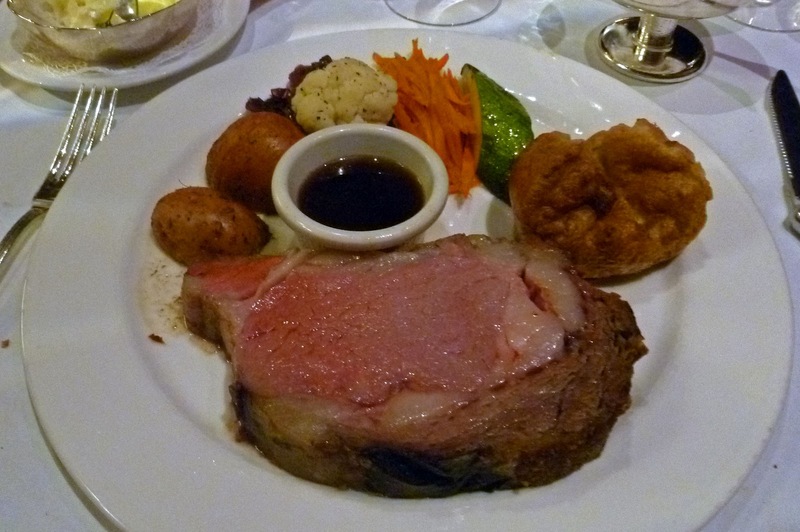 Compared to the Bay Area the prices of the meat were very reasonable. We had to rearrange the ice chest and dispose of some frosty beverages but we were able to share room to hold our bounty. 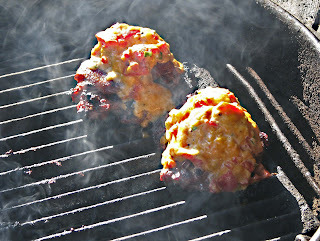 We cooked some cheese filled hot dogs in our trusty black iron. They were delicious. 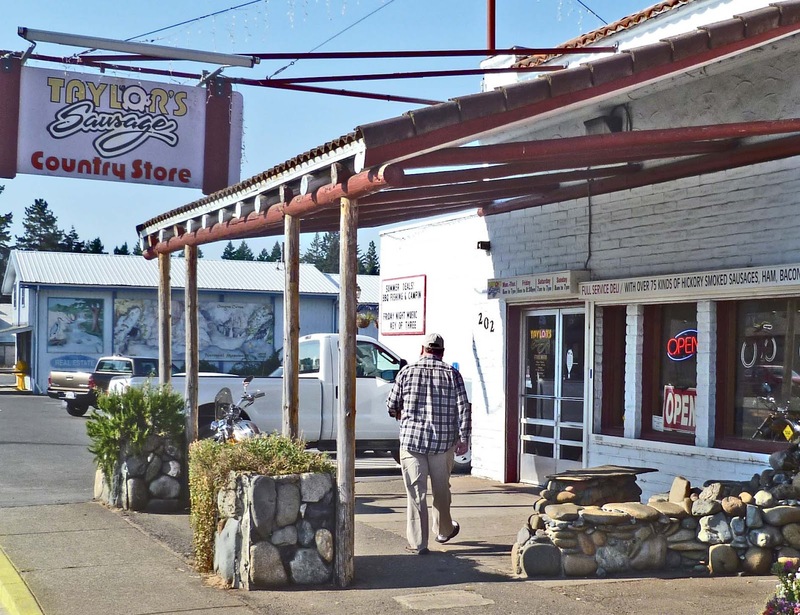 Taylor’s Sausage is a great find in the Pacific Northwest. 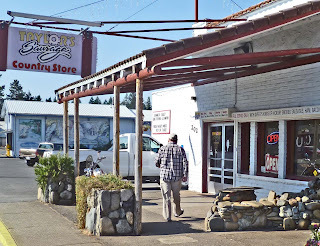 Cave Junction is a little over an hour from the coast and 30 minutes from I-5. 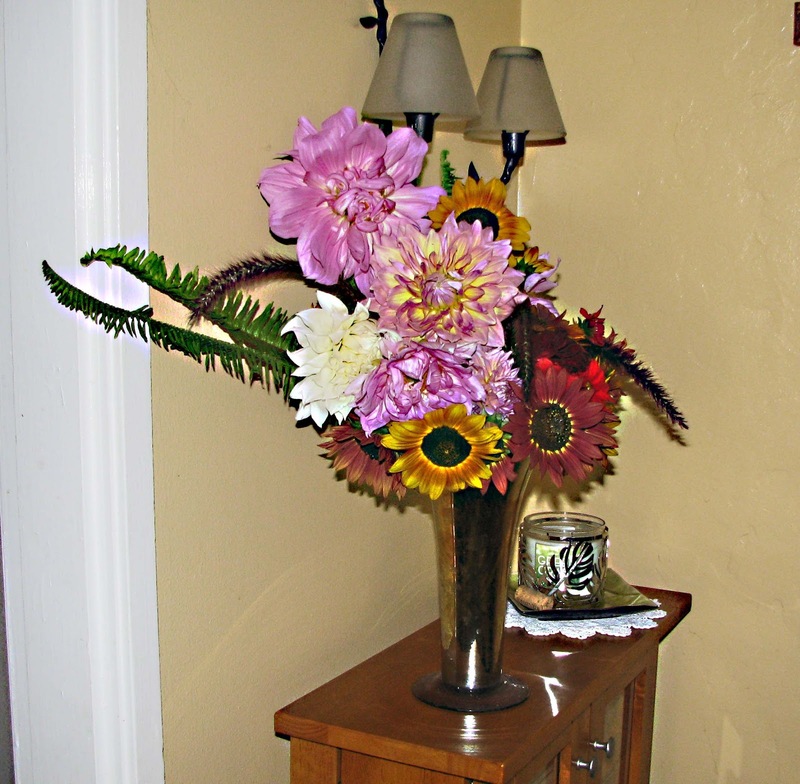 It was worthy of a road trip and it is a good thing they have mail-order services. 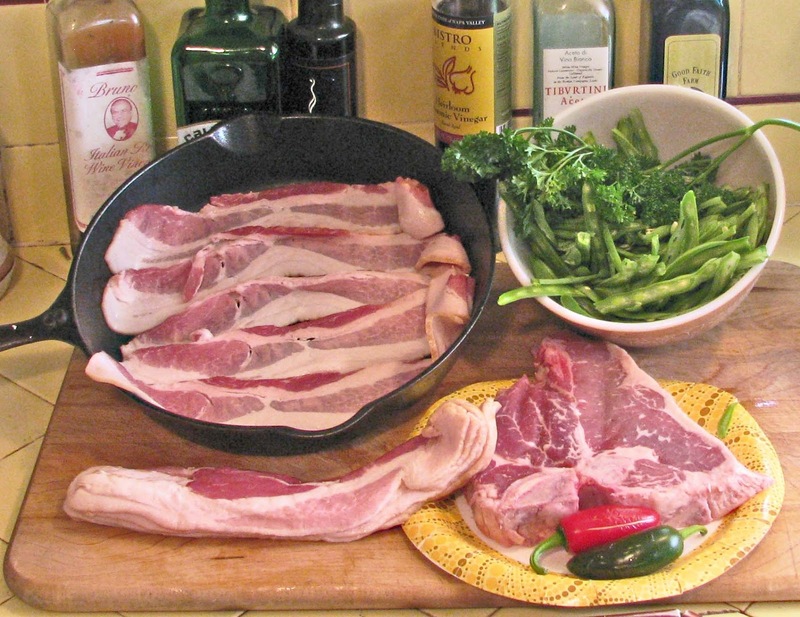 Some great looking bacon from Taylor’s will be on the plate soon. My favorite ‘Bro-In-Law’ John surfs and rides a Harley. 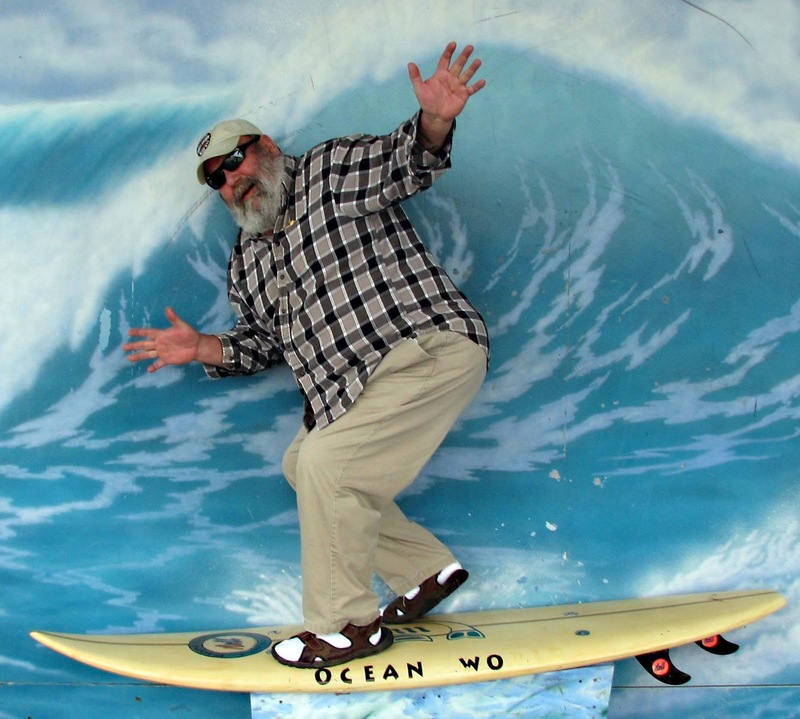 We have been staying at a spectacular beach front house in Crescent City California with John and his beautiful wife Shastina for the last three days. We have been relaxing and eating a lot of clam chowder in this coastal town. John and I were about to embark on a Meat Adventure to nearby Oregon when Ms. Goofy informed us that we were going on a Cheese Adventure to the Rumiano Cheese Company. Cheese to Ms. Goofy is like bacon is to me, so we could not refuse her request. John and I would have to put our Meat Adventure on hold temporarily. 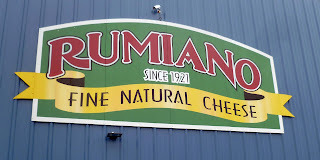 Rumiano Cheese Company has two locations at Willows or Crescent City California. They have been in business for over 90 years. 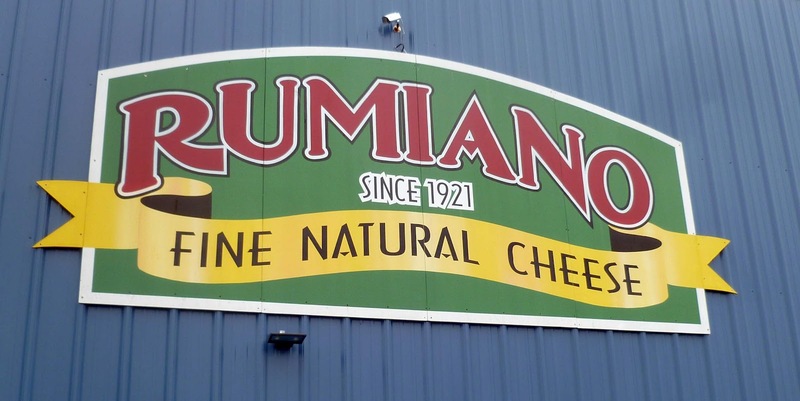 Rumiano produces a huge and varied assortment of cheeses. 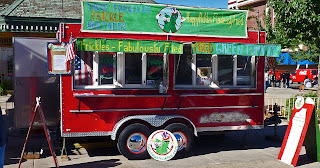 They have an organic line and a ‘Non-GMO” (Genetically Modified Organisms) line of products. All the dairy products are free of artificial hormones. If any of there products are salted, sea salt is used. This company is committed to sustainable work practices. It all sounds good to me, so let’s go inside. The building and facilities takes up an entire city block. In one corner is a small retail outlet. We walked through the door and Ms. Goofy started to swoon. 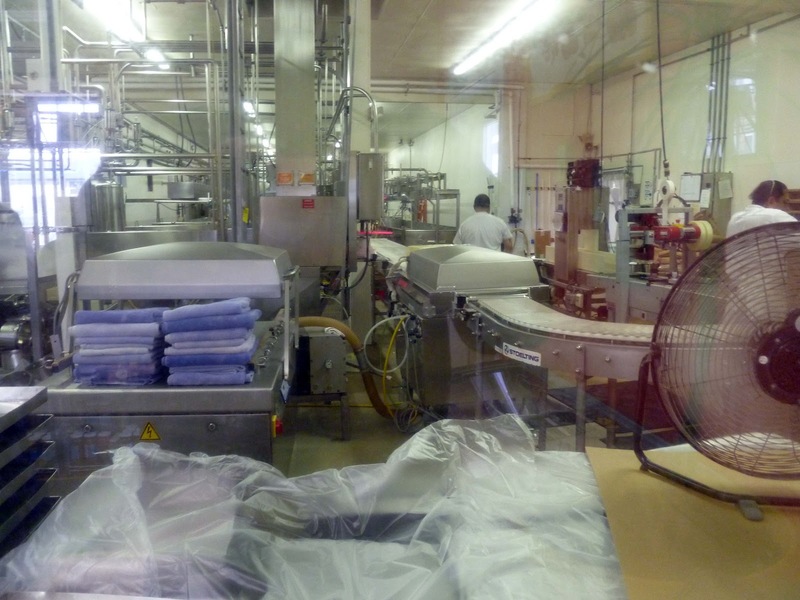 Several large refrigerators lined the walls brimming with cheese products. There was a large picture window that allowed us to view the cheese factory. My favorite part was the sampling table. Dozen’s of cheese sample were displayed and offered for tasting. John and I conducted a tasting tour of our own. So many choices of cheese made this excursion interesting. 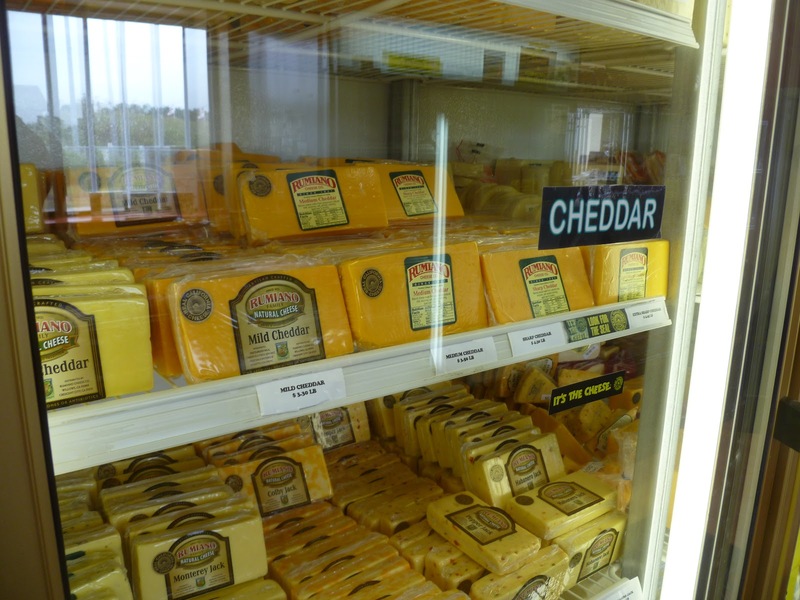 The one thing we noticed was how reasonably priced all these cheeses were. There was even a sale section of discounted cheeses. 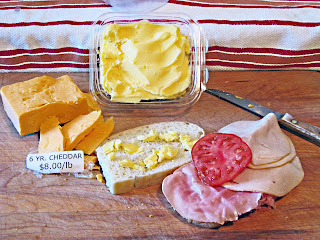 Six year aged cheddar at eight dollars a pound was a steal. Rumiano even sold butter at a fraction of the cost of a Supermarket. Ms. Goofy lined up a huge shopping cart full of products. I had to remind her that we only had one ice chest and needed room for the Meat Adventure to follow. We left Rumiano and returned to our beach side palace. Ms. Goofy was so enamored with Rumiano we returned the next day for even more cheese purchases. I made a ham & turkey sandwich with the aged cheddar cheese. I slathered fresh butter on the bread to create a golden crust on this sandwich. 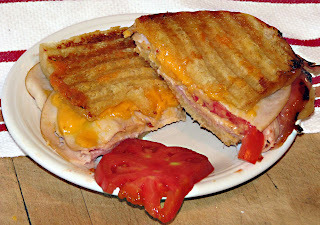 This sandwich was gooey delicious. Rumiano Cheese Company was a good adventure. John and I did get to go on a Meat Adventure later. 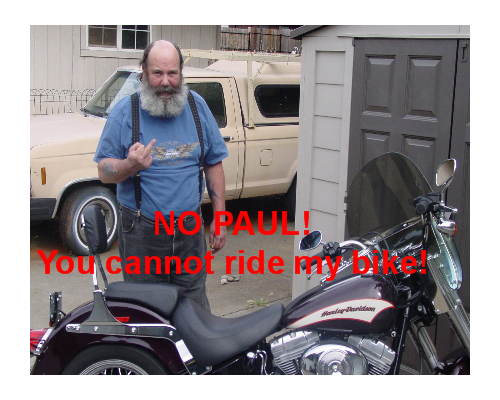 John, do you think I could ride your Harley Davidson? The vampires have been scarce since our visit to the farmers market in Lakeport, California. We met Sky Hoyt a specialty grower whose tag line is; “Food with Outstanding Flavor and Rare Fig Plants”. This farmer also grows several varieties of garlic. Today he had two different garlic’s displayed. 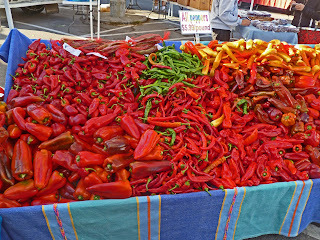 ‘Red Hot’ and ‘California Early’ We picked up a pound of both. 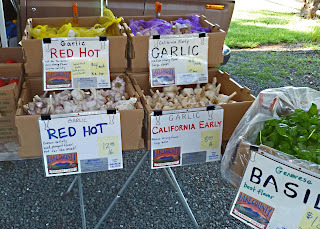 We have garlic tasting ahead. We peeled both varieties and tasted them naked. (The garlic). The Red Hot had an attractive red striped outer dried skin. A little sliver was consumed and a little kick in the palate happened.. This jolt was similar to a black pepper bite. Next up the California Early. 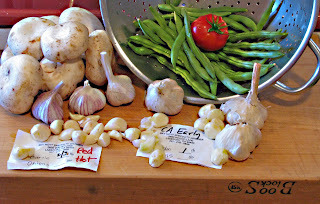 When the pure white dried skin was peeled away we noticed how juicy this garlic was. Sweet garlic juice covered our hands. 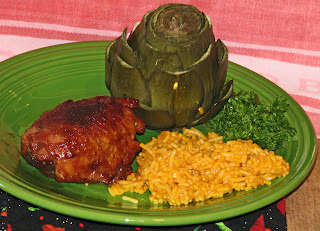 Yes it was a little sweet and with a very pleasant garlic flavor. We chopped both. The Red Hot went into some marinated mushrooms and the California Early into some sautéed home grown green beans. 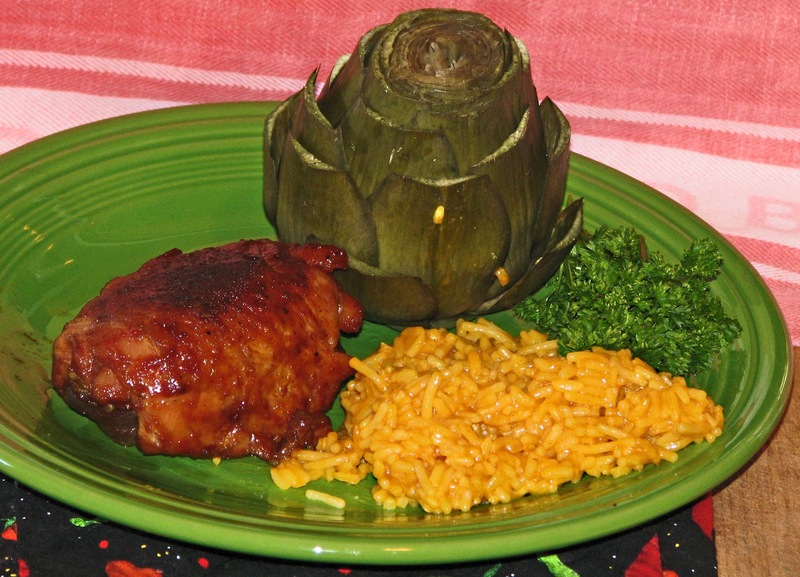 Both dishes turned out garlicky delicious. No Vampires were harmed during this post. 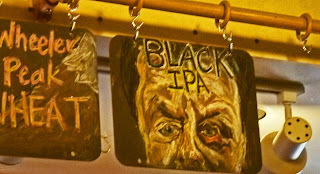 Black Eye IPA was a beer quaffed at the ‘Great Basin Brewing Company’ in Sparks Nevada. This beer, sometimes called an American Black Ale, was an interesting find. The beer is pitch black in color. The body and roast flavor is not as strong and heavy as a stout beer. The flavor has a slight roasted flavor complimenting the caramel malts and fruity hops. This beer has plenty of hop flavor and that is in the India Pale Ale style. This beer also has a high octane level of 7 percent alcohol volume. 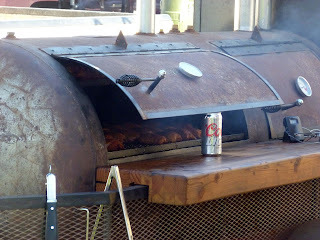 It was the perfect beer to whet our appetites for more ribs. 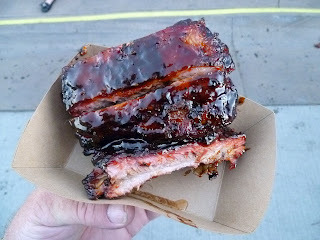 Ribs, Ribs, Ribs, have played an important place in our lives and diet these last several weeks. 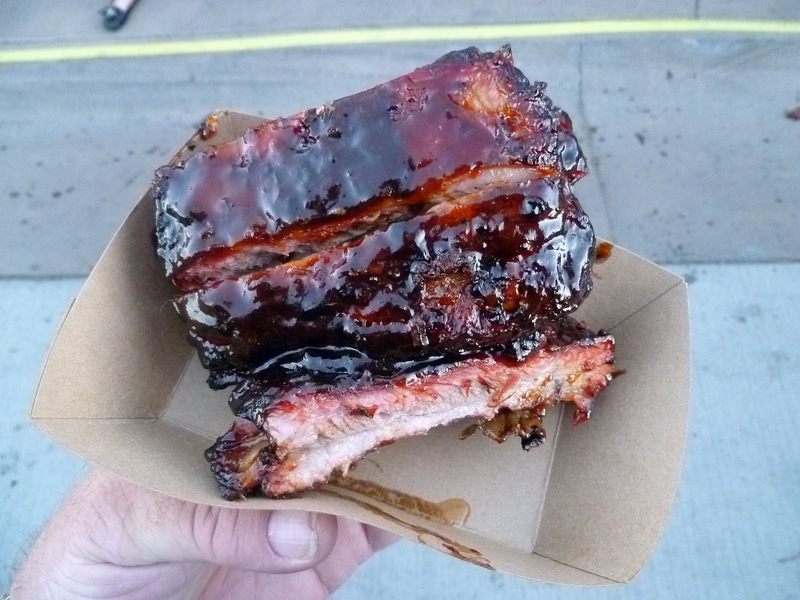 W.C. Fields once said “I have never met a rib that I did not like”. 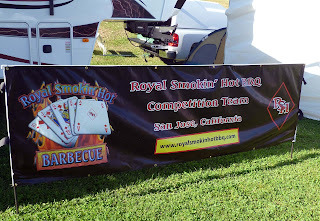 Well I just made that saying up but it is hard sometimes to find a bad rib at the multiple arenas we attend. We are ‘Certified KCBS Barbeque Judges’ and we attend a lot of events on the West Coast. 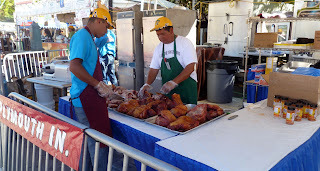 This week’s adventure was to the John Ascuaga’s Rib Cook-Off. 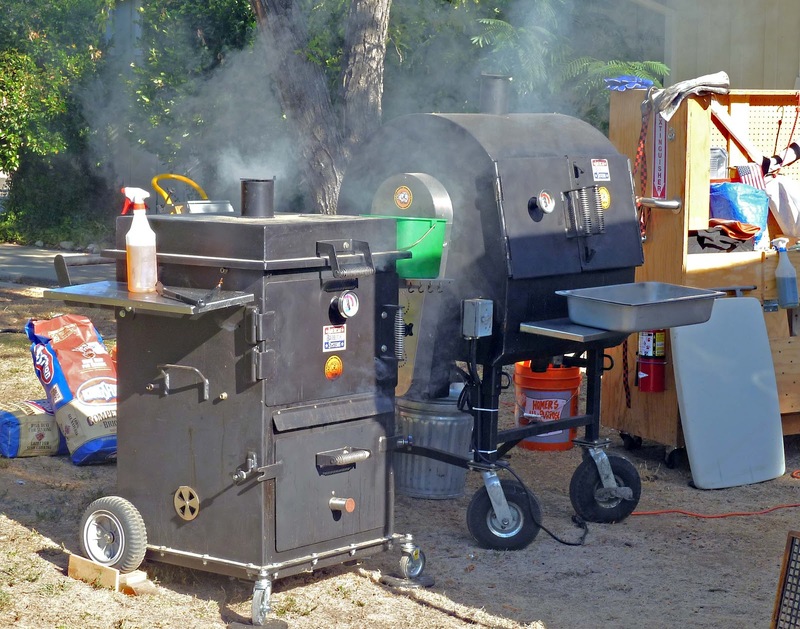 All of our BBQ events are our favorites, but this week we are on un-officinal business to a festival that cannot be missed. Six days of ribs, sun, party, shopping, music and mass rib consumption is what this event is all about. 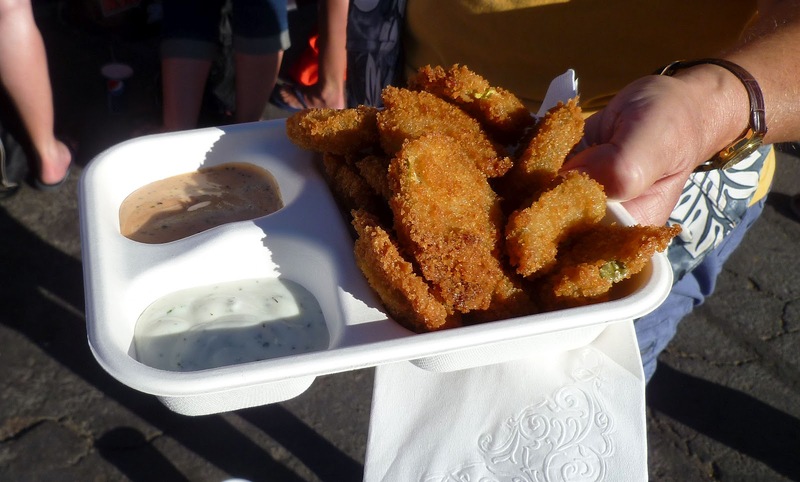 There is so much more than ribs, like deep fried pickles: battered with cornmeal and served with different dipping sauces. This would help cut the rib chain of damage, or may I say exhaustion of this rib journey. I jest. 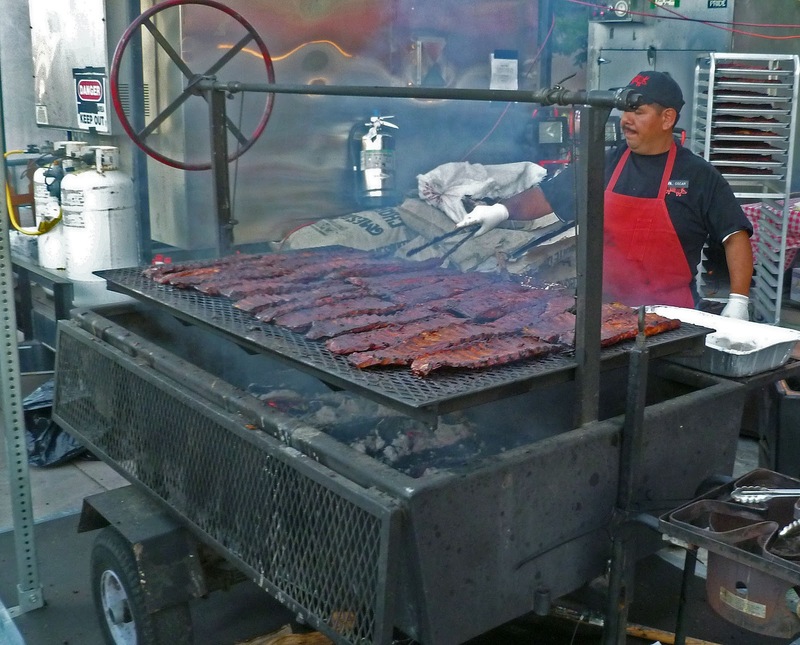 We could never grow tired of Ribs. Ms. Goofy wanted a change of pace. Our change of pace was the “Harrah’s Steak House”. This is an old school palace of meat and fine dining. 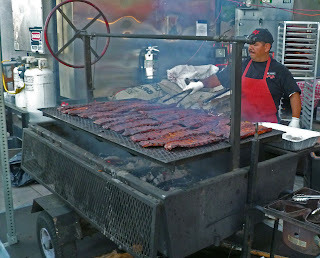 We were treated like Kings & Queens’ of this meat emporium and we loved it. What a great middle of the week adventure. 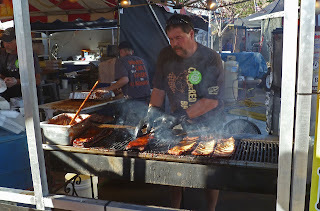 Ribs, Ribs, and possibly some more ribs made our several day rib excursion memorable. Oh, I did mention the Prime Rib side trip..